Australian Broadcasting Commission. 13 x 30mins. Producer: Maurice Murphy. 1972-73. LP (ST) Polydor. 2907 012. (CA 3204 012). 1974. Gatefold. "AUNTY JACK SINGS WOLLONGONG". The Cast of Aunty Jack. Cast: Grahame Bond, Rory O'Donoghue, Garry McDonald. Music and Lyrics: Grahame Bond, Rory O'Donoghue (C. Control/Albert). except "I've Been Everywhere" by G. Mack (Johnny Delvin Music). . Sketches & Comedy Material: Grahame Bond, Maurice Murphy, Gary McDonald, Rory O'Donoghue. Musicians: Rory O'Donoghue - Lead & Accoustic Guitar & Keyboards. Grahame Bond - Jewish Harp, Accoustic Guitar. Garry McDonald - Harmonica. Jamie McKinley - Piano. Greg Henson - Drums. Jeff Oakes - Saxaphone. Bruce Worrall - Bass. Stein - Bass. Vocals: John Derum - "Tarzan Vocals". Margaret Ferguccio - "Tarzan Vocals". Denny Carger - Vocal Backing. Judy Henderson - Vocal Backing. Creenagh St. John - Vocal Backing. Arrangements: Rory O'Donoghue. Music Produced by Grahame Bond, Rory O'Donoghue. Dialogue Produced by Maurice Murphy. Engineer: Wahanui Wynyard. Studios: United Sound, Sydney. Union Delegate: Spider Farrelly. Produced by Grahame Bond and Rory O'Donoghue for Bomudo Enterprises. Aunty Jack, Thin Arthur, Kid Eager Lost Somewhere On A Record. Rip Off. 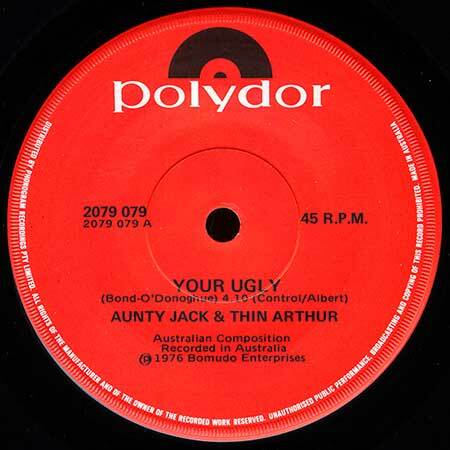 v: Aunty Jack, Thin Arthur. Gong A Go Go With Mr. Personality Norman Gunston. I've Been Everywhere. v: The Farrelly Brothers - Ernest, Ernie & Enzo. The Kid Eager. v: Kid Eager 'n The Gong. Doin' The Aunty Jack. v: Aunty Jack 'n The Gong. Man Of 1000 Faces. v: Mervyn Whipple & Sampson. Last Refrain. v: Neil & Errol. The Abbatoirs Discotheque. Veggie Queen. v: Kev Kavanagh & The Kavemen. Wollongong The Brave Revisited. v: Norman Gunston Minus The Gunstonettes. Head Of The Pack. v: Thin Arthur. Spider's Bucks Lunch. v: Len, Ron & Darryl. Don't Take It Off. v: Thin Arthur. What's On In Wollongong. v: Norman Gunston. Snowy Aloha. v: The Banjo Farrelly Brothers. Tarzan Super Ape. v: Origami Rock Opera. Fish Shakes. v: Terry Dutton. The Western Lady. v: The Farrelly Brothers. Aunty Jack 'N The Box. v: Aunty Jack, Thin Arthur Kid Eager. Farewell Aunty Jack. v: Aunty Jack & Thin Arthur. Muddy Mahawat, Aunty Jack. Erky Perky! 45 (ST) Polydor. 2079 052. 1974. 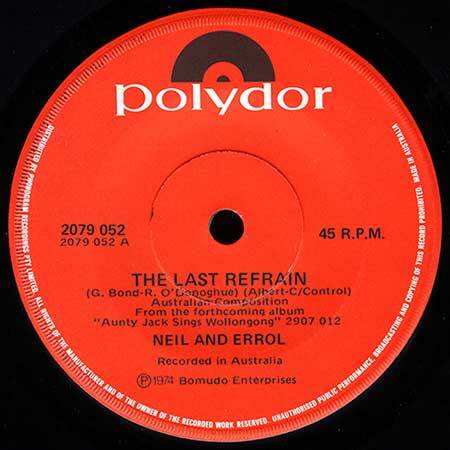 Side a: "The Last Refrain". (G. Bond - R. O'Donoghue). (Albert/C. Control). v: Neil and Errol. Side b: "Heavyweight Boxer". (G. Bond - R. O'Donoghue). (Albert/C. Control). v: Thin Arthur. 45 (ST) Polydor. 2079 057. 1974. 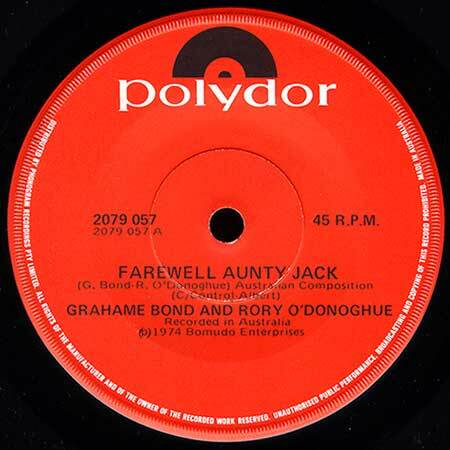 Side a: "Farewell Aunty Jack". (G. Bond - R. O'Donoghue). (C. Control/Albert). v: Grahame Bond, Rory O'Donoghue. Side b: "Doin' The Aunty Jack". (G. Bond - R. O'Donoghue). (C. Control/Albert). v: Grahame Bond, Rory O'Donoghue. 45 (ST) Polydor. 2079 060. 1975. 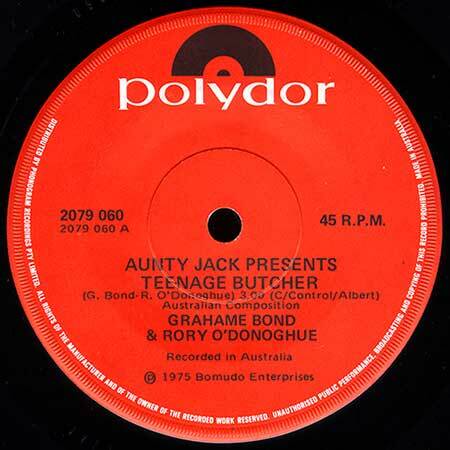 Side a: "Aunty Jack Presents Teenage Butcher". (3:00). (G. Bond - R. O'Donoghue). (C. Control/Albert). v: Grahame Bond, Rory O'Donoghue. Side b: "Aunty Jack Presents Doin' The Kev". (3:22). (G. Bond - R. O'Donoghue). (C. Control/Albert). v: Grahame Bond, Rory O'Donoghue. 45 (ST) Polydor. 2079 079. 1976. Side a: "Your Ugly". (4:10). (Bond - O'Donoghue). (Control/Albert). v: Aunty Jack & Thin Arthur. Side b: "Queen Of The Gong". (2:02). (Bond - O'Donoghue). (Control/Albert). v: Aunty Jack and Thin Arthur. 45 (ST) Picture. PRS 012. 1975. Picture Disc. Recorded at ATA Studios. Engineer: B. C. Brown. Side a: "Farewell Aunty Jack". (3:24). (G. Bond - R. O'Donoghue). v: Grahame Bond, Rory O'Donoghue. Side b: "Doin' The Aunty Jack". (2:15). (G. Bond - R. O'Donoghue). v: Grahame Bond, Rory O'Donoghue. 2CD (ST) Shock. AUNTY1. 1996. "AUNTY JACK SINGS WOLLONGONG". (Re-issue of LP Polydor. 2907 012. 1974). Additonal sleeve credits: Backing Vocals: Maggie McKinney, Denny Carter (LP sleeve - Carger), Judy Hederson (LP sleeve - Henderson), Michael Fawdon, Trevor White, Stevie Wright, Tony Rose, Nick Hill. Synthesisiers supplied and built by Kim Ryrie (later of Fairlight). Produced by Grahame Bond and Rory O'Donoghue for Bomudo Enterprises. This album was recorded in 1974, sometime. Copyright 1974 Bomudo Enterprises. CD1: - Track title variations (CD vs LP). Doin' The Aunty. (LP - Doin' The Aunty Jack). (b) Ri Fol Market. (LP - (b) Ri Fol Strawberry). What's On In Wollongong. (LP - What's On In Wollongong. v: Norman Gunston). Fish Milk Shakes. (LP - Fish Shakes). CD2: "AUNTY JACK - THE AUNTYOLOGY (1972 - 1985)". (Previously unreleased tracks). 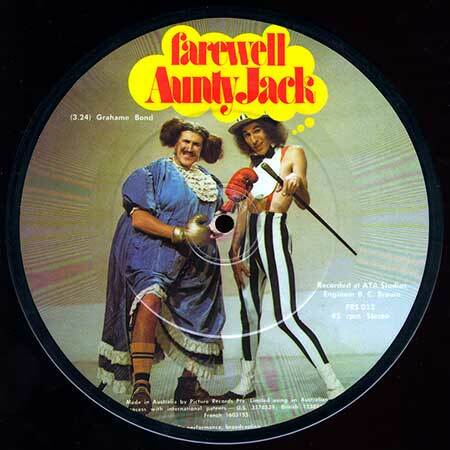 Farewell Aunty Jack - The Single. Doin' The Aunty Jack - The Flip. Pearl Pureheart - A Mellow Drama. A Football Opera - The Great Scrum Of Life. Dear Scarlet - A Tragic Tale. Herman The Brave - A Beach Opera. Teenage Butcher - A Love Song (Rated M). Do The Kev - Audience Partipit....Precip....Join In. La Kookaracha - A Latin Meat Song. You're Ugly - Another Love Song (Rated R). Budgie Pizza - Not For Vegetarians. LP(t) (OP) K-Tel. TA-249. "UNREAL!" S1-Tk5 "Farewell Aunty Jack". (O'Donahue - Bond). v: Grahame Bond. LP(t) (AD) Fable. FBAB-5304. 1975. 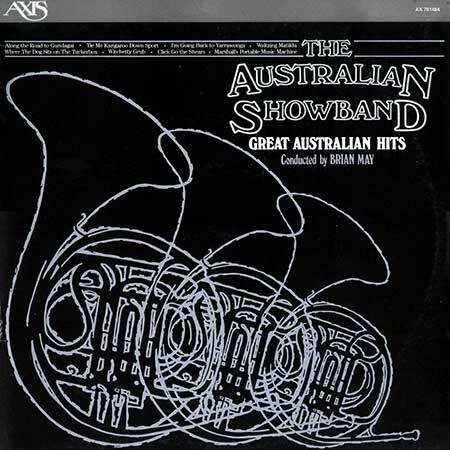 "GREAT AUSTRALIAN HITS THE AUSTRALIAN SHOWBAND". The Australian Showband consists of members of the ABC Melbourne Showband conducted by Brian May. S1-Tk2 "Farewell Aunty Jack". (3:03). (Bond - O'Donoghue). (Albert). LP(t) (AD) Axis. AX 701484. 1975. 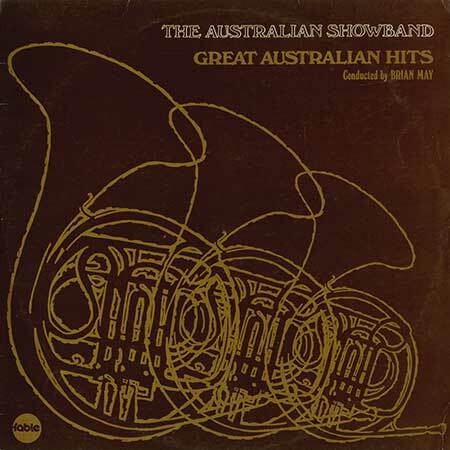 "GREAT AUSTRALIAN HITS THE AUSTRALIAN SHOWBAND". Consists of members of the ABC Melbourne Showband. Conducted by Brian May. S1-Tk2 "Farewell Aunty Jack". (3:03). (G. Bond - R. O'Donoghue). (J. Albert & Son). LP(t) (ST) (See COMPILATIONS - AUSTRALIAN TV's GREATEST HITS: S2-Tk7). 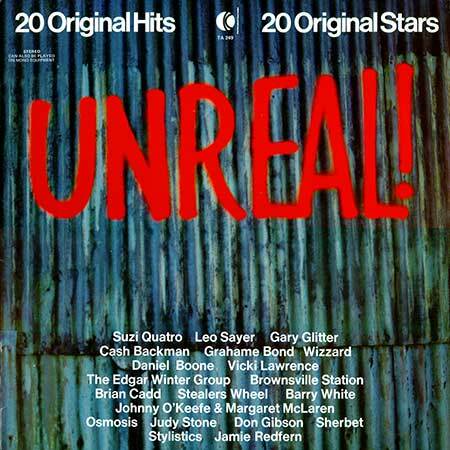 LP(t) (AD) (See COMPILATIONS - TV TIMES RECORD OF YOUR TOP TV THEMES, THE: S2-Tk3).